Python is a powerfull, oriented langage. The syntax is very simple and easy to learn. A lot of Scientific modules exist. Why use Python to interact with the system ? As many X-ray experiments (see ESRF or Soleil), a lot of hardware should be used for one experience. In fact, experiment logic is not always the same, then it is hard to develop an ergonomic Graphic User Interface. It is easier for scientists to type commands. Synchrotron users or Diffractometers users usualy uses SPEC Langage. 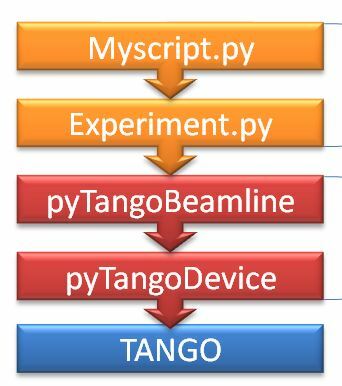 Python comes with a command line object oriented, wich can connect to Tango Devices. LIONS have developped some Python modules, wich can connect automatically to a branch of the TANGO system, considered by us as a experiment. A python object is automatically generated for each Device server.